I pack my children an organic home lunch every day. Why? The quality of our school lunches is pitiful. There is high fructose corn syrup in everything (apple sauce, crackers, etc.). The vegetables are canned; the fruit in thick syrups. Ketchup is counted as a fruit. Furthermore, my daughter is a vegetarian, so there are few options for her. In what I feel is an ironic move, a Chicago public school has banned home lunches to improve children’s nutrition. At his public school, Little Village Academy on Chicago’s West Side, students are not allowed to pack lunches from home. Unless they have a medical excuse, they must eat the food served in the cafeteria. A brief search did not yield any info on the quality of their school lunches, and I think it a bit bizarre they have a link to “Christmas Photos” on their homepage. Not many public schools use the big “C” word anymore. Remember separation of church and state? If my children attended Little Village Academy, you better believe they would be bringing an organic school lunch from home. Thank you Jessica Gottlieb for sharing this story on Facebook. This is horrid but, not surprising..they are taking over a little at a time. Think foods (toxins) and medical industry (vaccines!) I wouldn’t feel their “lunches” to my dog! It is going to take ALL moms to change things, and change things we must. We are more powerful than we think, the quality of our children depend on it. Congratulations for being part of the probable 1% that packs their children organic lunches. I mean that in no jest, but unfortunately the other 99% that feed their kids garbage, resulting in spiked child obesity cases are the ones to hold responsible for this. 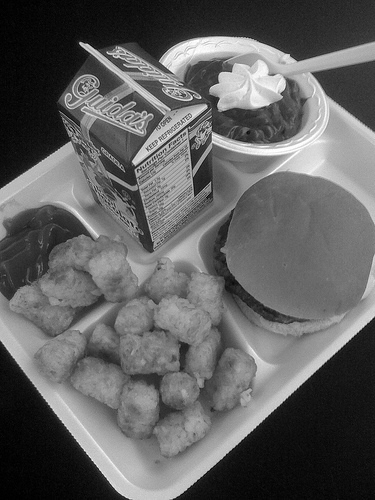 I would count on your cafeterias kicking it up, as they’re taking on a new role of providing self-proclaimed nutritious lunches for all students, because I too remember how gross and greasy my school cafeterias were. There is no reason to ban or decline the desire of any family who wishes to feed their children themselves and save money in the process. Growing up, my parents gave me money to eat in the school cafeteria or mom asked that I make my own lunch. That meant a lot of cafe food for me. I was a pudgy, awkward teenager — it was a good thing I played sports. My parents fed me well at home, with the worst sweets in our house being ice cream. I am fortunate. Most children are not. Americans simply do not know what a balanced diet looks like, or how much food is correct for portion sizes. The parents of these kids who bring their own lunches should be praised for being so involved in their kid’s lives. School districts are also decreasing snack time, causing kids who already have poor diets to be hypoglycemic as well – and decreasing their ability to think. (it’s a good thing logic isn’t taught in school anymore !!! jest!!!) The whole issue is disgusting and makes me sad for school boards trying to make a buck by selling terrible food to ignorant people — and now trying to make a buck of people who know better. What a shame. My solution: have the people who made the rules eat in the lunch room with the kids for a month, see if they are satisfied with the quality of the food, or if they can go 3+ hours without a snack. They should also have to wear a dunce cap.